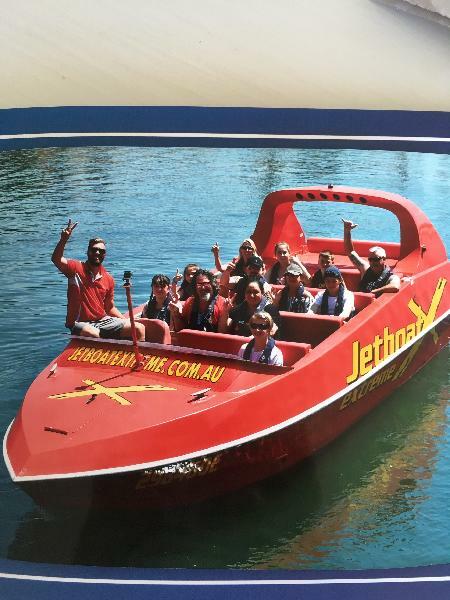 Hold tight for the an exhilarating 55 minute jet boat thrill ride on the Gold Coast Broadwater! Jump in our comfy padded seats aboard our extreme jet boats, while the jet-powered turbo engines take you on speeds up to and over 80km/h. You may even spot a dolphin or two racing alongside the boat! Brace yourself for amazing stunts, sweeping fish tails, power brake stops, and wild wave riding in this spectacular Gold Coast playground! More 360 degree spins and high speed adrenaline than you can imagine as you twist, slide and jet your way through the ride of your life! Our jet boats have jet powered, turbo-charged, intercooled monster engines by Yanmar Marine, coupled with Hamilton Jet units pumping an amazing 30,000 litres of water per minute - these extreme jets could empty an average home swimming pool in 55 seconds! Excellent experience, driver brilliant!! I’d recommend. It was our pleasure to have you on board! Glad you had such a great time and experience with our team. Looking forward to seeing you again soon! So much fun!! Well worth it and would definitely recommend!! Good trill ride. Unfortunately the boat encountered some problem. The experience level was tone down than usual ride. Your message has been sent to Jet X - Jet Boat Thrill Ride - Surfers Paradise. You should hear from them shortly. Please note: all responses will come directly from Jet X - Jet Boat Thrill Ride - Surfers Paradise, and not the team at Bookme.